A new study found that small so-called damselfish emit chemical distress signals upon capture by predators. This attracts more predators, which increases the chances of escape for the damselfish. Fish harbour a chemical substance in their skin that is released upon injury. It triggers fearful and escape behaviour in nearby fish, but until now scientists hadn’t identified the benefits to the sender. ‘For decades, scientists have debated the evolutionary origin of chemical alarm cues in fish,’ says study lead author, Dr. Oona Lönnstedt, fish ecology researcher at Uppsala University. Although fright responses to alarm cues provide obvious benefits to surrounding individuals, benefits to senders of alarm signals have been unclear, according to Dr. Lönnstedt. But the new study found that the chemical cue attracts additional predators to the capture site. ‘Chemical alarm cues in fish seem to function in a similar way to the distress calls emitted by many birds and mammals following capture,’ says study co-author Professor Mark McCormick from the ARC Centre of Excellence for Coral Reef Studies at James Cook University. 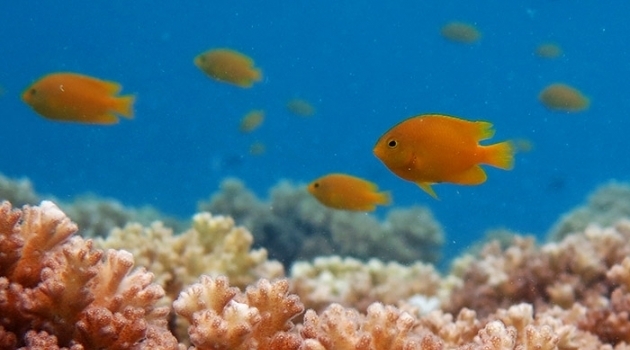 When the researchers investigated what happens when chemical alarm cues of damselfish are released on the Great Barrier Reef, they found that lots of additional predators were attracted to the cue release area. ‘More predators would seem to mean more trouble, but we discovered that additional predators interfere with the initial predation event, thus allowing the prey a greater chance to escape,’ says Professor McCormick. In a series of laboratory trials, the Swedish-Australian research team found that additional predators attempted to pirate the prey, and in the ensuing commotion, the captured damselfish had a greater chance to break free and hide. ‘When caught by a predator, small damselfish have almost no chance of escaping their fate as the predator’s next meal. However, when another fish predator is attracted to the capture site, prey will escape about 40 percent of the time’ Professor McCormick says. This is dramatic proof that chemical alarm cues are beneficial to senders – and give small prey fish a hugely increased chance of not ending up as dinner. ‘These findings are the first to demonstrate an evolutionary mechanism by which fish may benefit from the production and release of chemical alarm cues, and highlight the complex and important role chemical cues play in predator-prey interactions on coral reefs. It all goes to show that coral reef fish have evolved quite a range of clever strategies for survival which are deployed when a threatening situation demands,’ Dr. Lönnstedt says. The study is being published in the scientific journal Proceedings of the Royal Society B.